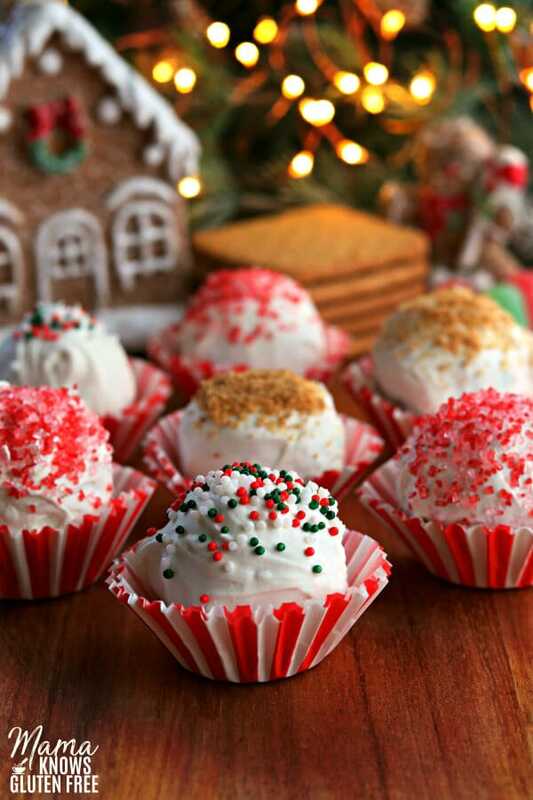 Easy no-bake Christmas truffles! These homemade gingerbread flavored truffles are super easy to make. They are a no-bake, gluten-free dessert that is perfect for Christmas parties! The recipe also has a lactose-free option. Gluten-free chocolate truffles are an easy show-stopping dessert to add to any cookie tray or to bring to a Christmas party. These Gluten-Free White Chocolate Gingerbread Truffles are the perfect Christmas truffles! I love gingerbread anything. It’s one of my favorite flavors from the holidays. There is nothing quite like the smell and taste of gingerbread. It’s just so cozy and totally feels like Christmas to me. Gluten-free gingerbread cookies can be hard to find, so I used one of my favorite cookies, Schär’s Honeygrams. Their Honeygrams are so delicious. They have a sweet honey taste and a satisfying crunch. They made a perfect “gingerbread” cookie for these white chocolate truffles! I absolutely love Schär gluten-free products, and they make some of my family’s favorite gluten-free products! They have everything from certified gluten-free bread, to rolls, pizza crust, cookies, crackers, and snacks. If you don’t have gingerbread spice you can make your own: 2 teaspoons ground ginger, 1 teaspoon ground cinnamon, 1/4 teaspoon nutmeg, 1/8 teaspoon allspice. Dip the gingerbread balls into the white chocolate dip and make sure you cover all sides. Remove the gingerbread ball with a fork and place on a parchment lined cookie sheet. Immediately sprinkle with the gluten-free sprinkles and crushed Honeygrams. 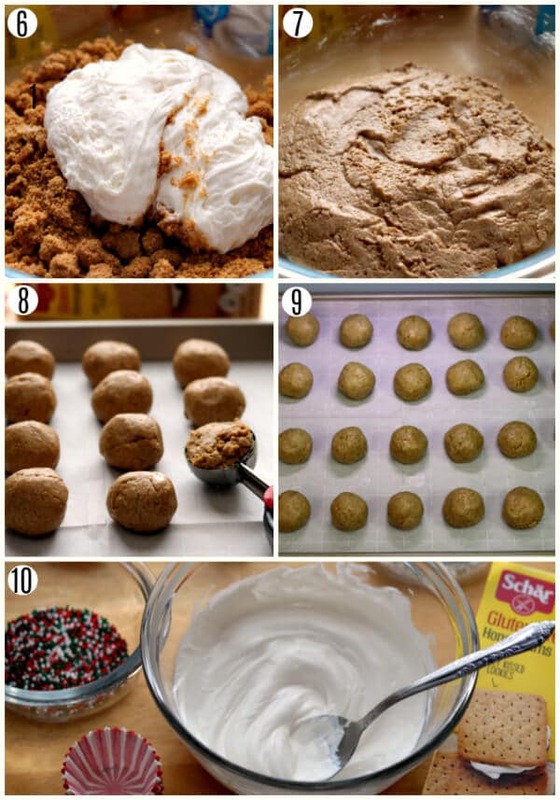 Allow the gingerbread balls to completely dry before serving, either on the counter or in the refrigerator. Refrigerate the truffles in an air-tight container. Enjoy! I learned a great trick from Mel’s Kitchen Cafe. When dipping the gingerbread balls into the melted white chocolate, use a fork to remove the ball and then slide the ball off the fork with a knife. You can watch the awesome tutorial video from Mel here. This recipe can be made lactose-free. Schär’s Honeygrams are lactose-free, and you can use dairy-free white chocolate chips and dairy-free frosting. These homemade truffles are super easy to make! They are a no-bake, gluten-free dessert that is made with only a few ingredients and in less than an hour. They are so fun to decorate and make the perfect gluten-free dessert for Christmas parties! 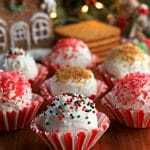 More Gluten-Free Christmas Dessert Recipes To Try! Easy no-bake Christmas truffles! Homemade gingerbread truffles that are a no-bake gluten-free dessert that is perfect for Christmas parties! The recipe includes a lactose-free option. 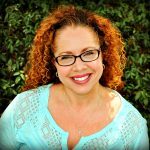 If you don't have gingerbread spice you can make your own: 2 teaspoons ground ginger, 1 teaspoon ground cinnamon, 1/4 teaspoon nutmeg, 1/8 teaspoon allspice. Add the vegetable oil to the white chocolate chips in a medium saucepan and melt over low heat, stirring constantly; remove from heat. You can also do this in the microwave. Heat the chocolate chips and oil at 1-minute increments and stir after each minute until completely melted and smooth. Add the gingerbread spice, ground cinnamon, molasses and pure vanilla extract to the melted white chocolate chips and stir until fully combined. 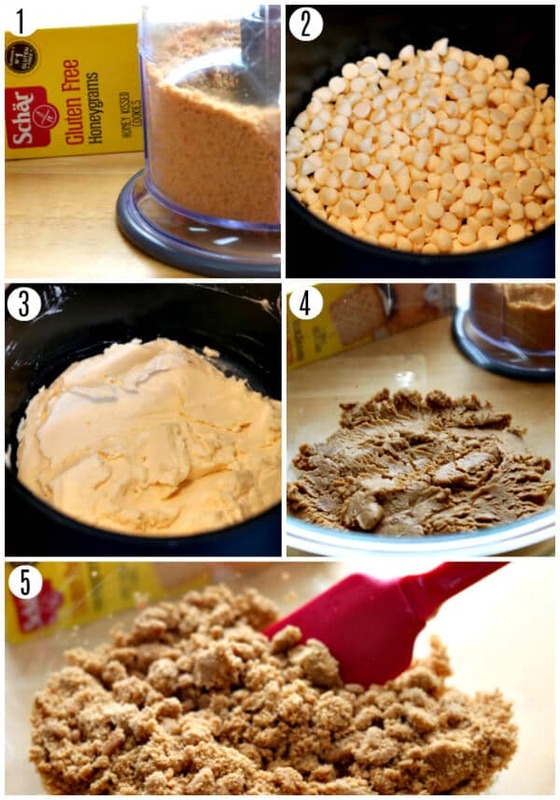 Pour the white chocolate mixture into a large bowl and add the Honeygrams crumbs and the vanilla marshmallow frosting and stir until fully combined. Using a cookie scoop (or a tablespoon) scoop out the gingerbread mixture and roll into a ball and place on a parchment-lined cookie sheet. 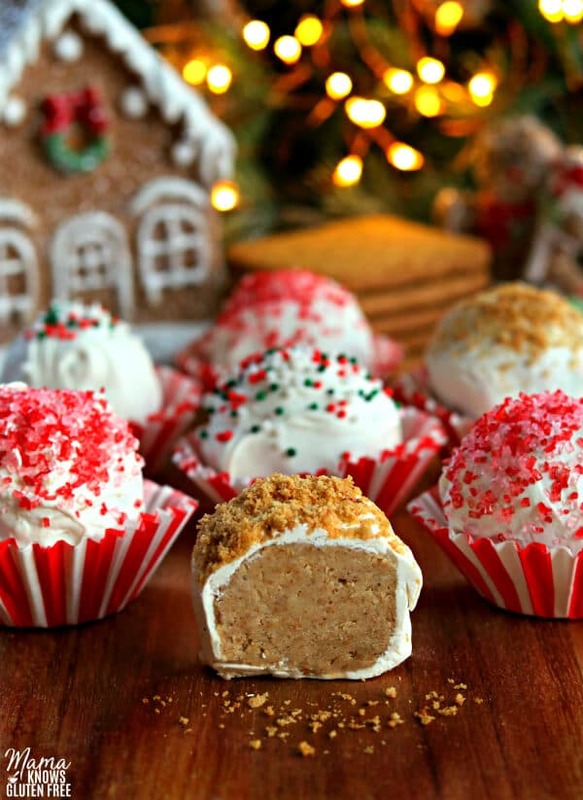 Place the gingerbread balls into the freezer for 30 minutes. After the gingerbread balls are chilled, melt the white chocolate dip in a medium-sized bowl according to the package (candy melts, almond bark, or white chocolate chips. If you are going to use white chocolate chips, add 1 tablespoon of vegetable oil per cup of white chocolate chips. Allow the gingerbread balls to completely dry before serving, either on the counter or in the refrigerator. Refrigerate in an air-tight container. Enjoy! This recipe can be lactose-free by using dairy-free chocolate chips and dairy-free frosting (I used Pillsbury). When dipping the gingerbread balls into the melted white chocolate, use a fork to remove the ball and then slide the ball off the fork with a knife.